NiceHash has released an updated version of their Axiom CPU Miner Launcher that provides a simple and easy GUI for running the optimized cpuminer-multi fork (source). The new releases apparently includes optimizations from sandor111 that further increases the performance for mining Axiom on CPU. Compared to the previous version from about a month ago we are seeing about 90% increase in performance on an Intel Core i7 5820K processor and apparently AVX2-capable CPUs seem to have the highest performance increase, though older processors will also get increased hashrate. 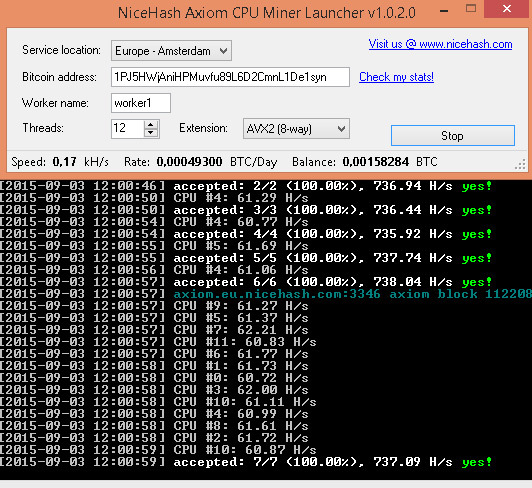 So if you are mining Axiom on CPU you might want to try the updated miner with GUI to ease the mining on NiceHash and get paid directly in Bitcoin. The Axiom crypto coin is a new altcoin that has generated quite some attention in the last few days with one of the main reasons behind it being the fact that the Axiom algorithm has been added to NiceHash/WestHash. The coin is originally intended to be CPU mined and the latest release of the cpuminer-multi miner from tpruvot has added support for that algorithm, but there is already a more optimized fork available from NiceHash. So if you want to get the most performance of your CPU you might want to download the cpuminer-multi fork from the NiceHash repo on GitHub, there is also a simple and easy NiceHash Axiom CPU Miner Launcher available to simplify the use of the miner that also integrates your profit statistics. 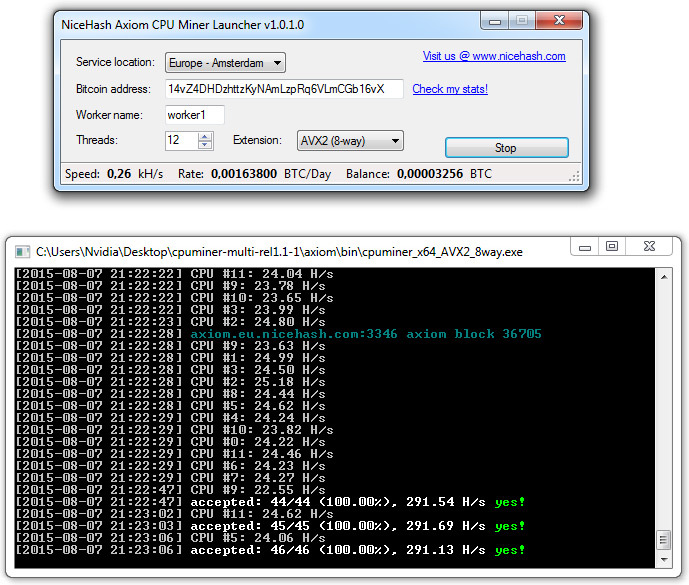 So if you are interested in the Axiom mining you might want to check out the optimized cpuminer-multi fork and the launcher, do note that there are mining pools available where you can directly mine Axiom and the coin is already being traded on Bittrex and C-Cex along with a few other smaller altocoin exchanges. Currently the Axiom coin looks like a nice altcoin to mine and sell or to sell your hashrate directly for BTC bringing nice profit for CPU mining, but we’ll have to see how things will work out on the long term, so you might want to be more careful if you want to stack on coins.